Peter, the proprietor of the thrift shop, tells me his story. I don’t know why people tell me so much about themselves, but I’m glad they do. I’m fascinated by the events and decisions that determine the course of people’s lives. Linda at the repair shop shared her story, too. So that makes two personal stories in one day! Anyway . . .
Peter and his wife are from Portsmouth, a harbor city on the southern coast of England. An 18-foot Swift Accord travel trailer was their home. Peter made a living fishing from his own boat. Misfortune struck, or maybe it was good fortune when one looks in hindsight. Several storms whipped through that area. One ferocious storm ripped Peter’s fishing boat from its moorings. The boat was lost. To add insult to injury, it rained so hard — 7 feet of rain in one year — that their home sunk into mud up to the axle. Very discouraging, no doubt. Tired of the storms, Peter and his wife emigrated to the United States and settled in the desert Southwest. Hmm . . . not hard to figure why they chose Arizona. They opened a restaurant in Wickenburg. They aren’t in the restaurant business any more; now they manage several enterprises including the thrift store. Peter and his wife are happy to be in Arizona. I admire people who have the gumption to pull up stakes and start over. This cactus grows between the wall of their thrift store and the parking lot. I don’t know the name of it. (It’s about 3 feet in diameter.) It is a beauty! Shortly after the crew and I arrived here at our free camp on BLM land north of Wickenburg, Arizona, I ordered several items from Amazon. Today I receive the phone call . . .
Before I placed the order with Amazon, I looked up UPS places online. First I call “Your Secretary & Shipping.” The rate to receive a package? Two dollars per package! With all I’m going to order, I could end up paying $20 or more. Not acceptable. Next I call “Kaley’s Sew and Vac” and ask about their rates. The lady on the phone says, “The first package is free and every package after that is fifty cents.” Well, that’s more like it! Here’s what was in the big box from Amazon: two Benchmark atlases — Wyoming and Washington (Now I have all of them! ), a hummingbird feeder (! ), a stick-on-the-window bird feeder, a telescoping campfire fork, two boxes of Calgon, a collapsible water dish for the crew when we hike, an LED motion-sensor, stick-up light, and a hiking pack. All this stuff can be seen on the Shopping Links pages. I stuck the birdseed feeder on the window above our bed. I don’t know if I’ll get any birds with it that close to our faces. If I do, I’ll certainly see them up close! I’m not going to mess around with the hummingbird feeder at this camp. I haven’t used my new campfire fork yet because it’s too windy for a campfire. Lots of dreaming and planning over the atlases already. Dropped some Calgon down the toilet. Stuck the LED light on the wall in the bathroom. Put the collapsible water dish on the floor with water in it, hoping to train the crew. Of course, Bridget and Spike act like they don’t see it. I put some things in the hiking pack and try it on. So far I like it! Now I can carry all the stuff I want to take on hikes. You can read more about it on the “For the road and campsite” page. I’ll let you know how well it functions after a few hikes. I’ve never worn camo before! Have I told you lately I love your comments? I found the remarks relating to the last post about the PTV’s brake inspection very helpful. Thanks a lot! If you aren’t in the habit of clicking on the word “comments” below, I suggest you take a look at the discussions that occur after each post. My readers share lots of relevant information, along with personal experiences, funny anecdotes, poignant stories, warnings, and encouragement. I’m very proud of the reader participation in my blog. 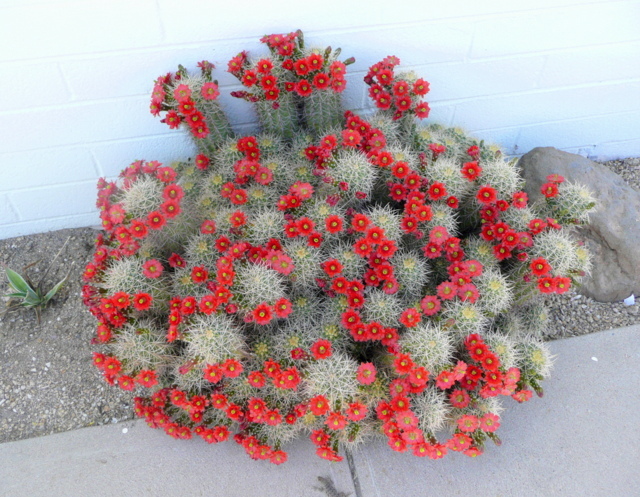 This entry was posted in Simple living and tagged Arizona, cactus, flowers, hiking, RVing, Southwest, UPS, Wickenburg. Bookmark the permalink. I have to say “I am “Pi***D”. I noticed you answered some of the last posts on the last chapter then nothing till this. I was genuinely worried as were many others I am sure. Next time you decide to take this much time off the blog let us know….We care what goes with RVSue and her Canine crew. Jim, I get concerned about her also when she doesn’t post, but that doesn’t happen very often. If she didn’t post for a few days, then I’d start getting worried. I think it’s nice that she has readers who are so concerned about her welfare. I hope that when I finally am on the road and blogging that I will have readers who will be concerned about what happens to me. Donna . . . Yes, it is a blessing to have readers who care about my welfare. I’m sorry you were worried. I posted on the 21st and the 23rd. That’s not good enough? I post about 20 times or more a month. Many bloggers can’t manage once a week or let months go between posts. Writing a post takes a big chunk out of a day and though it may look easy, it isn’t for me. I don’t know why — perfectionism maybe — but I find it hard to write a post that says…not blogging today, see ya later! People follow my blog and are notified every time I post. I feel like I should give them something substantial every time or not at all. I appreciate your concern. I really do. Let’s not forget though that I am living a life beyond this blog, a life that makes this blog what it is. I didn’t mean to be rude or obnoxious but I do feel a connection with you and the crew and it just seemed strange knowing your posting pattern to see you just suddenly stop. I know I am old and a worrywart so forgive my impatience. Pretty pics of cactus, this is their time of year. I understand how a break in pattern could be worrisome. You aren’t the first to react that way. I’m hoping you aren’t still mad at me!!! I was never really mad at you, just worried something might have happened to you or one of the crew. I probably overreacted, but………”to err is human, to forgive, divine”. Please don’t allow yourself to feel pressured to write on a schedule or to plan activities just for the sake of your blog. That’s the surest road to blogging burnout! I hope blogging remains enjoyable for you because I (and obviously many others) enjoy your writings. I wasn’t worried a bit. We just spent several days at Burro Creek, no phone, no internet. Of course, my readership is not the worrying kind😊. I can go quite a while without a post…lucky you RVSue. Now back at Gila Bend. Guess I better post something since I have solid internet. Burro Creek is a great place. We were there in March last year and saw herons learning to fly over the creek. I used to drive up out of the canyon in order to get signal and blog. There’s a pull-out on the way back to the main highway. 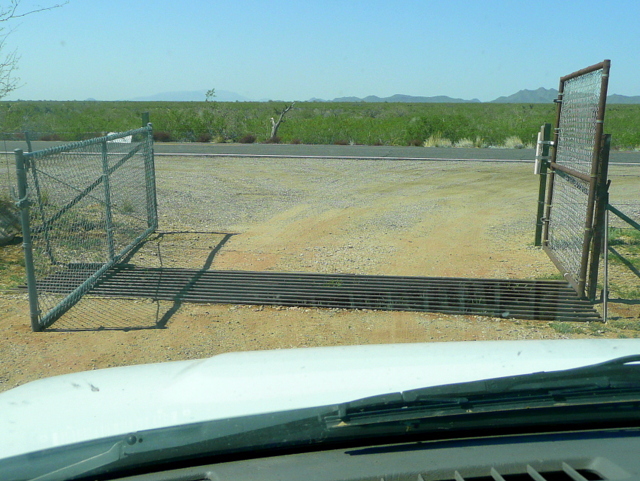 Be careful if boondocking in the Gila Bend area. I’ve heard it’s a drug smuggling thoroughfare through there. Also saw a drug bust in Gila Bend on the news last night. Not to scare you, just be mindful. We are on the Air Force Auxiliary Field…pretty secure. Have seen Border Patrol helicopters flying at night. While in Burro Creek our cooler was stolen. Thought of your post and figured a thirsty traveler had need??? Old cooler, just some V8 and cranberry juice and I wanted a new cooler anyway. Never heard a peep…. I agree, Burro Creek is a great place although as per usual I’m more interested in the rocks there than anything else. Lots of agate, pastellite, and misc. rocks to collect. I seem to go there almost every year except this year. Your blog has been a blessing to me! You’re welcome, Dedra. Nice of you to tell me. I just hope this Hummingbird feeder is better……on second thought I could use another great laugh. I don’t think I’ve found all the sugar-water spills from the last hummingbird fiasco. Dried sugar is like concrete! If I tried this feeder and it leaked, I’d go mad. Enjoyed your post, as I do all of them – thank you! PS: It didn’t occur to me to be worried. I mean, not that I know you anyway, but even if you were a friend of mine, I wouldn’t worry this soon (two days), and would figure you were off having fun, were Internet-connection challenged, or just didn’t feel like blogging. PPS: Should have mentioned that it’s the Washington Benchmark(s) on Amazon that I was referring to. I researched the two editions and couldn’t find the difference. Maybe GPS coordinates are in the latest edition (I’m guessing here.) The important stuff is in the 4th edition… stuff that doesn’t change much like topography, campgrounds, roads, rv parks, public lands. I didn’t want to pay $10 more for unknown “improvements.” I’ve looked at the Washington 4th ed. and I’m pleased with it. BTW, all three of the reasons you gave for not blogging applied to me yesterday. I had internet connection (5 bars), but the Verizon card kept dropping and saying “ready” but wouldn’t reconnect. It wears me out. This is my third attempt to reply to you. Jim’s comment took two tries. Well thank you for replying! I know how frustrating that can be and appreciate that you took the time/effort. Beautiful pictures of the cactus blooms. Desert woman is now Desert Camo woman! I thought the Calgon was for some pampering but after reading the shopping link..it’s for the pooper goopers! If your black water holding tank is 3/4 full….all the sloshing around as you drive to the dump station should take care of any cling ons! Never heard of the Calgon tip…good info. Is there a way for you to add an edit function? Sometimes corrections are needed or more thoughts pop into one’s mind AFTER the post comment button is selected. I wish I could add an edit button. Blogging platforms like WordPress don’t give those kind of options to mere bloggers. It has to come from WordPress. The Calgon never worked for me. But some swear by it. Who knows. I switched over to 5 Star Happy Camper. Calgon reminds me of ……………Calgon take me away! Kind of like Avon’s skin so soft bath oil used as insect repellent. Some folks swear by it. Ahhh the BEAUTY of independence and freedom! Admitting myself I too was getting worried. I kept checking/refreshing since Thursday. I guess I was sort of thinking Spike and Bridget would hit the keyboard and fill us all in on what had RVSue so occupied. I’m glad I am not the only one obsessed with RVSue and her Canine crew’s adventures. I love the flowering cactus!!!!! Hi Kay . . . I’m happy you enjoy my blog! Please realize for the future that sometimes I have to get away from it for a day or two and other times I travel to places with no service. Yes, that cactus is a stunner. Apparently it loves the heat from the white wall and the sidewalk. Yes, I totally understand. Taking a break is a nice refresher, plus we’re not on anyone’s time clock! So ready myself to find a place to park the “G-Mobile” in a secluded place and hide for a few weeks away from the noise. I love my internet connection and as I prepare for us to head out on the BIG adventure I am leaning towards satellite internet, already have the satellite TV set up. Kay, you may want to reconsider satellite internet. I used it for 4 years….4 very frustrating years. My set up time was very fast compared to many other campers. Something like 20 to 30 minutes. Since switching to air card, I am a very happy camper. Grrrr….. the last trip to the PNW using only cell phones with hotspot and the data plans and all that mess, I was without service even in Oregon City proper! That’s why I was thinking of going with satellite this time around. I have T-Mobile and they USED to be really good, not so much anymore. I want service in really remote areas as well in downtown areas. Yet, I don’t to have to up between midnight and 6AM to download files either… I think I will have no hair left by the time I am ready to leave at this rate. Did the motion sensor LED lite we gave you bite the dust??? Ours is still working great. The cactus pix are beautiful. Really windy here today. Cannot believe how much STUFF we had in the MotherShip…..box after box after bin…..u get the idea.! No, that light is still going strong. I decided to put the new light on the wall and use the one you gave me in different places. I’ve been using it like a flashlight when Spike wants to go out in the night. I might set it next to their water dish and see if they like it coming on when they go for a drink at night. Sue, I purchased the Benchmark atlas of Wyoming. Is there any way you can explain how I can figure out where the boondocking areas are? I have looked at it several times and feel kind of stupid because I have not been able to figure it out. I would like to order others but I need to know I will be able to read them. Look in the Recreation Guide section (not landscape). Let’s use page 16 as an example. See all the yellow starting above Powell and spreading over most of the center of the page? That’s BLM land and free for camping. Now look on the left side of the map. That green area is Shoshone National Forest. There’s another green area in the upper right corner. That’s Bighorn National Forest. In the upper left is some more green. It’s more of the Shoshone NF. All the green NF areas are free for boondocking. You’ll see campgrounds in National Forests which are not free, but except for the area immediately around the campground, you can boondock for free. Many times good boondocks are on the roads marked with a very thin, hairlike red line branching off a secondary road. What I do is study the map and find a location that looks desirable considering elevation, water features and such. Then I take the name of the nearest town and do an online search, like “boondocking near Powell, Wyoming” and go from there. I hope this helps. I’m glad you asked. And thank you for ordering through my links. Thank you so much for the information. I am going to look at it now. Yup… We have been in their thrift shop! I bought four different items tbat day and they are all special keepsakes of our visit to that area! Peter’s accent is very obvious! TeeHee! Sue, I am not your mother… so if you take a day or two off, I won’t be ticked off 🙂 But, I think it is sorta sweet how people are protective of you. Last year I left the cactus desert earlier and missed their blooms, so seeing this one was a nice surprise. I don’t want people mad at me because I take a break! I admit, I had a choice of blogging or watching the DVD I bought at the thrift shop. I was lazy and chose the movie! As u should, after all that’s what this lifestyle is about. I would get concerned if I hadn’t seen anything in a week and u hadn’t mentioned being away for a week but everybody deserves time off. If u weren’t out living this wonderful life, u wouldn’t have a lot to blog about. Always good to read ur posts and thankful u find time to share the good life with us. I need a like button. I am glad you are making what Sue wants #1. 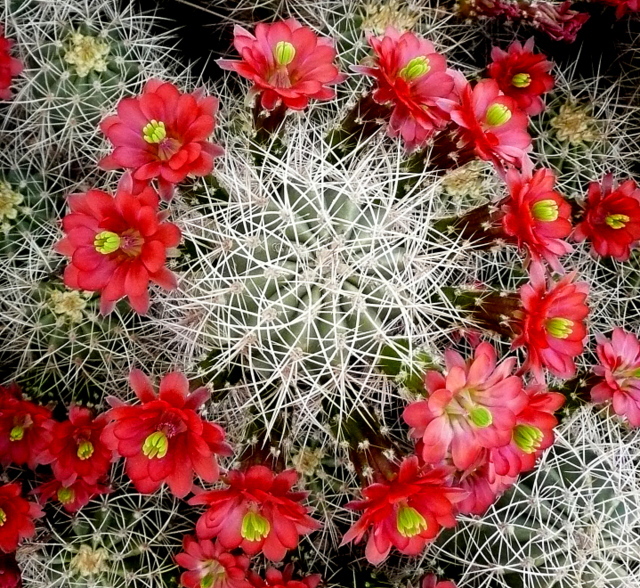 This particular cactus is especially beautiful with its red flowers. I really enjoy all the desert pictures as I have never been there and am longing to do so. Thanks for answering my previous question about your internet service. I am curious and was wondering what made you decide to purchase the Casita vs.Bigfoot orTrillium? Thanks. I’m pleased you enjoy the desert photos, Barbara. I eliminated the Bigfoot and Trillium because they are made in Canada and I lived in Georgia. Soon after deciding to buy a fiberglass egg trailer, I realized I’d be better off buying new. It’s hard to nab a good used egg trailer before someone else gets it and it’s even more difficult when based in Georgia. That made me look at where the trailers were manufactured. Rice, Texas, though not close to Georgia, was easy for me because I have a sister living in Mississippi, about halfway to Texas. The fact that I had to buy sight unseen didn’t bother me. I could tell what I wanted from the Casita brochure the company mailed to me and from the online showroom. I wondered about the older versions of the Benchmarks also. I was going to order one time, but all that was available was several years old. I don’t remember now the specifics, just made me not order in case a new one came out. If you’re not going to be needing an atlas for a while, and if you have the patience to wait, then it’s good to wait for the new one. I used the Oregon atlas that Rusty gave me (2010) when I was there last summer and it was great! I love reading your posts. Laughed out loud over the cow experience! I am retiring at the end of this year, and now I really can’t wait to get on the road!Also love to hear about the antics of Spike and Bridget! Be careful on your travels! Hi, Karen… Thank you for your upbeat comment! I know you must be very excited about retirement. You should be… It’s wonderful! I’ve been remiss about posting the antics of the canine crew. Maybe we’re bored with each other… Ha!! When we head out we will have 3 dogs with us. Should we worry about them exploring the desert off leash? i’m sure your guys are desert wise, not sure if mine would be. Both Bridget and Spike got a thorn in their paw from the cholla cactus. One time is all it took. Now they are very careful and I even think they avoid cholla. Other dogs bounce into cholla, get a pawful, then try to pick out the thorns with their mouth, and make matters worse. You’ll know which type your dogs are. I don’t know about snakes. Bridget stays close to me off-leash. Spike is more adventurous. I take risks but not crazy ones. I have seen Spike back away from things he doesn’t understand. I’m sure there are people who think the crew should be on-leash at all times. I don’t let the crew run around loose in the early morning or at dusk when coyotes prowl. You can let your dogs off-leash in the desert. How much and in what parts of the desert is something you learn as you go along. I wish I could give you a definite answer. Oooops, we are on Vancouver Island. Thanks for letting us know, Irene! Oddly, I didn’t know there was such a thing as a telescoping campfire fork. Even more oddly, I’m actually in the market for one. Just ordered from Amazon. Thanks for the timely idea! You’re welcome. Ha haha! I don’t know why but your comment makes me laugh! Love the cactus, we always leave before they bloom, that one is beautiful. I left early last year, before blooms. I’d love to see the saguaros bloom… maybe next year. I wish I knew the name of that cactus in the photo. Sue, I looked on Google and the closest picture that looks like it is…hedgehog cactus in bloom. Linda in Benson, Az. So THAT’s hedgehog cactus! I had heard the name but didn’t know what it looked like. Thank you, Linda. We were just visiting the Phoenix botanical Gardens yesterday and saw lots of hedgehog cactus…none in bloom there yet. What a wonderful place to visit of you ever get the chance. Took about 100 photos! Sue, do you use the Calgon bath salts for odor control? Is that too personal? I imagine blue water. Ha Ha. It’s those little details that we are curious about when planning our full time rv living. Love your blog. You’re right, Al. Only I think of it as my own private, gated estate! There is a slot at the bottom edge of the card. Rather than go wireless I plug a cable in there which at the other end plugs into my inverter for power. The card also has a tiny, round “socket” (can’t think of a better word) where the adapter cord in inserted The cord connects to the Wilson antenna. You have to move a little rubber “door” to find the place on the card where the adapter cord plugs in. Thank you for your reply, the nice young man in the store was clueless, especially when I told him what I wanted it to do. Enjoying your blog. I have searched for that cactus on line. It does not look like the Hedgehog cactus as the flowers in your picture look too small I searched thrift stores in Wickenberg and found Soroptimist, Kuriois and the Gypsy Boutique. Which one was it, as I will phone them to see if they know what variety of Cactus you have in your photo. Really would like one for our yard here in Gilbert. Enjoy your blogs very much. Let me know if you have any other answers. Thank you. Hi ! to Bridget & Spike. It’s the Pony Thrift Store. Good luck! Nice to hear you enjoy my blog. I don’t know if you’ve done this… Click on the cactus photo that shows a close-up “halo” of flowers. The photo at full size is spectacular! Wow you are so right. Just gorgeous. How long do they stay in bloom like that? I’ve been thinking about how we readers of RVSue&Crew look forward to your posts – it’s addictive. Then looking at it through your eyes (am I being presumptuous here?) daily posts can become like a ‘job’ or a chore. Heck! The muse sometimes just won’t inspire. When that happens – it happens. We love you anyway. Such a sweet comment. Yes, there are times when the words won’t come. I fuss with it, sputter, and give it a rest. The cactus is a Claret Cup Hedgehog aka Echinocereus coccicus. It can form clusters of more than 3 ft across. It grows in AZ, NM, south CO and central TX and 3 Mexican states. ps. I grow cacti as a hobby here in the Netherlands and visit the USA every year to travel the country white a (rental) motorhome. Next trip is 04/15 to 05/15 start in Las Vegas so in 3 weeks we will be in the area. Thank you, Rob, for sharing your cactus expertise. Have a wonderful trip next month! Hi Sue – I think Pam P nailed it – your posts are addictive! My three RV/boondocking books that I ordered from your Amazon link (and a trombone shorty CD – not exactly RV-related, but fun to listen to!) have my husband and I in a strong planning stage for operation get-on-the-road. We figure with our crew (one antsy jack russell, one cat who thinks he is an antsy jack russell and one cat that tolerates (barely) the both of them that we should be called Geo and Kel in their RV ^*(*)! Thanks for all the great info you share with all of us. Hi Kellee… I’m glad the books are helping you and your husband make travel plans. It’s an exciting time for you. I wish you great adventures on the road with your own crew. And thanks for ordering stuff through my links. Hi, Ron . . . Come on out to the desert! The sunshine is fine! I don’t know when it’s too hot to camp here. We’re perfectly comfortable right now. Heat tolerance differs in people. Maybe a seasoned AZ boondocker or resident will answer your question. You’ve got those wheels…. If it gets too hot for you, move to higher ground. I’m really leaning that way…I have family not to far from there so I could at least see them..it’s 1350 miles from here which is not bad although I have been thinking of going south and get some gumbo in two weeks..we will see…. It’s great to have choices… ah, freedom. I’ve earned the right to wear camo? What an honor! Great pictures. I’m looking forward to Bridgett and Spike having a post. They are always such clever canines. Right now they’re sleeping. Spike did something very brave this morning that I’ll share in the next post. Bridget did her part, too. Wow – that is an absolutely fantastic cactus! Click on the small pic… Amazing! I look forward to your blog every day, but when there was no entry I just assumed you were off enjoying yourself … exploring your big backyard, visiting friends, running errands in town, or just didn’t feel like writing. Wouldn’t want this blog to become a chore .. then you’ll stop! Lovely photo of the cactus. I appreciate the way you highlight the beauty of the desert. People think of it as drab and brown but it really has it’s own beauty. I also enjoyed reading about Peter. My parents and I immigrated from England to Canada in the late 50’s. When I look back on it, I realize how brave they were. They had both finished service in the Army and felt like their prospects in England were limited. They heard there were good oppporunities in Canada so they decided to take a chance. My mother and I stayed behind while my father looked for work in Toronto. He lived in a boarding house for several months, saving every penny until he had enough money to buy a ticket for us. How brave .. they were just a young couple with a 3yr old, leaving their families and everything familar to move to a new country with just a HOPE they would be successful. And they were! I know other folks my age in Canada who have very similar stories. I’m sure Peter and his wife were full of concern when they made the move … but it turned out well for them too. So thanks for sharing his story. And thank you. Caroline, for sharing YOUR story. This continent was populated with a lot of brave people like your parents… young and full of hope, many with nothing more than a willingness to work and a faith that hard work will bring a better life. You must be very proud of your parents, as you should be. The pictures are wonderful – so much color! I loved the cow story – right at the top with the Alien story (but of course I am a geek). You are a fabulous story teller! The joy you have just leaps off the page! Thank you, Katy! I consider myself a geek, too… glad you enjoy my stories. I love my fanny pack, it’s just not camo, but does hold two water bottles and misc other stuff. Plus keeps the weight off my poor shoulders and on the solid hips. It is really fun to hear people’s stories. I talked to a lot of folks in South Africa. I bet those stories were very interesting and enlightening, too. Good to know you returned safely, Gaelyn. I need to take a look at your blog. I’m way behind on my blog-reading. Hi Sue. Love your posts. We are new RV owners and wouldvlike to know what the purpose of adding Calgon to your toilet in the PLT. Sandra, check out https://sites.google.com/site/cbruni/, or google The Geo Method. We use the liquid Calgon. We can get it at our local Walmart.